Singapore companies can go global regardless of size, says former Member of Parliament Leong Horn Kee, who now runs his own boutique corporate finance advisory firm. Homegrown firms big and small have succeeded in expanding abroad, driven by the survival instinct, a motivated management and some restructuring of business functions, he said. Speaking to The Business Times on what he gathered from working on his doctoral thesis, the 61-year-old added that the companies that have gone abroad have all experienced revenue growth, though profit growth did not necessarily follow immediately. His 450-page thesis, researched and written to earn his Doctor of business administration from the University of Western Australia (UWA), included qualitative case studies of 14 Singapore manufacturing companies listed on the Singapore Exchange from 1998 to 2007. Dr Leong, now chairman and chief executive of CapitalCorp Partners, said: "I can tell Singapore companies now that whatever you do, there are things you shouldn't fear. The typical fear is that you have to compete with multinational companies. The conventional view is that you need a base of human resources, finance and technology. "But with hard work and over time, companies have been able to manage their resources and capabilities to tackle world markets. "There's no reference size - that if you're below a size of $10 million (in market capitalisation), you don't do it, or that you must be above $50 million." Small Singapore companies can venture overseas, he said; Singaporeans' ability with English, along with their upbringing and exposure to the world, are facilitating factors. He spent four years on his research, working a couple of hours each evening. He used data from companies' annual reports and interviewed senior executives such as company chairmen and chief executive officers. Two strong themes emerged from his research. One was that companies took wing abroad simply as a matter of survival. "Practically every CEO I interviewed said 'If I don't do it, I won't survive. If I don't go out there, I won't be something. Eventually, some big boys will come to Singapore and take over my bread. So I better get myself out there and compete with the big boys.'" The other theme that cropped up consistently was that top management, especially the CEO, drove the internationalisation effort. Companies were also restructured so that functions such as finance and technology were centralised, while functions like human resources were decentralised. Dr Leong said one interesting finding was that the companies did not really need government support to venture overseas, "though general encouragement is still useful". He said one company that stood out was a food-and-beverage manufacturer that broke into markets in Eastern Europe and former Soviet Union countries, overcoming barriers of language, regulations and local laws. "Those were difficult countries to enter, but through sheer hard work, persistence and frequent contact, they built a global business. "They had to open the market, choose the brand and make the taste acceptable to locals. But once they got in, their first-mover advantage was a barrier to entry to competitors." The market value of this firm leaped from around $30 million in 2000 to about $300 million in 2007. Another company, an engineering services firm, had a market value of just $5 million when it underwent a restructuring in 1998. Singapore was its base. But, using technology from the United Kingdom and undertaking manufacturing in Malaysia (where it was cheaper), it eventually expanded to markets as far away as Latin America. Its market cap grew 60 times to $300 million by 2007. "They became internationalised using the comparative advantage of different countries to service the world. If they had just remained a Singapore company, using Singapore resources, their growth would have been very limited," said Dr Leong. 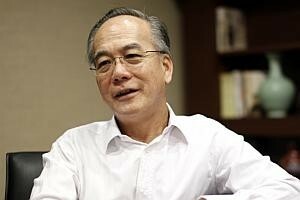 The former MP of the Thomson ward in the Bishan-Toa Payoh GRC from 1984 till 2006 was a civil servant in the Ministry of Finance and the Ministry of Trade and Industry. He has also worked for property giant Far East Organization, and was managing director of Orchard Parade Holdings and Yeo Hiap Seng. He said he decided on the topic of internationalisation for his doctoral thesis because of his work in the area in the private and public sectors. This doctorate is his sixth degree, coming after his masters in business research, also from UWA. He has two other distance- learning bachelor's degrees: one in Chinese language and literature from Beijing Normal University; and the other, an economics degree from the University of London. His remaining two degrees, earned through full- time study programmes, are his bachelors in engineering and an MBA from INSEAD in France. He said: "Research is quite a lonely process. You're all by yourself, you don't really have classmates, you have to be self-motivated." He said he hoped to use his experience from completing his doctorate to give talks - to business school students, for example. He is also pursuing plans in the private-education business, given his experience with distance-learning programmes. But it is too late to think of doing another degree, he said. "If I were 10 years younger, I might have done a doctorate in Chinese literature or a traditional Chinese medicine course."